Bicycles are supposed to be great vehicles when it comes to keeping the earth green and giving you a good workout, right? Well, apparently newer bicycles these days tend to let up on the sweating part by allowing a little electric-powered engine to help you out during the steeper moments in life. 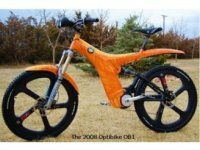 Optibike is one of those companies, and their 2008 range of electric-powered bicycles will have the limited edition OB1 as the flagship of the series. Its main component is the patented Motorized Bottom Bracket (MBB) that drives through the derauiller gear system to optimize acceleration and range at all pedaling speeds. This special system is now oil cooled and is capable of delivering 850 continuous watts of power. Other goodies include carbon fiber handlebars, brakes, derailleur, chainring and cable ferrules, a customized paint job, GPS satellite navigation, plus a wireless PDA interface that provides real-time feedback on remaining range, battery charge and motor temperatures – are you drooling already? Talk about one high performance bike! I wouldn’t want to let this out of my sight even for a moment, and would do well to get the most secure parking options available in the market. After all, there will only be two dozen of the exclusive OB1s available throughout the world, and they don’t come cheap at $12,995 each – which is more than enough to buy a small, compact sedan. A trio of other models will round off the 2008 range, consisting of the 800Li, the 50 mile range 600Li and Optibike 400. All of these will feature “build-your-own” bike customization options, with prices starting for $4,995 upwards for the 400 watt model. Well, it sounds like a great intra-city vehicle to move around in. Just make sure you wear a helmet whenever you head outdoors as you never can tell when one of those deranged motorists hit the road.